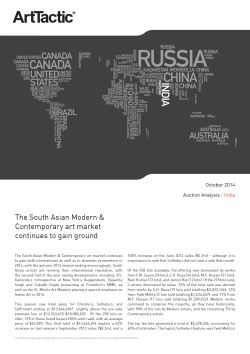 The autumn season of South Asian auction sales for Christie’s, Sotheby’s and Saffronart raised a total of $13,644,694 (excluding buyer’s premium), within the estimate of $12,943,625-$18,080,630. Of the 258 lots on offer, 218 of these found buyers (85% sold-rate), with an average price of $62,590. This final total of $13,644,694 implies a 63% increase on last season’s September 2013 sales ($8.3m), and a 158% increase on the June 2014 sales ($5.2m) – although it is important to note that Sotheby’s did not have a sale that month. Of the 258 lots available, the offering was dominated by works from F.N. Souza (36 lots), S.H. Raza (24 lots), M.F. Husain (21 lots), Ram Kumar (13 lots), and Jamini Roy (12 lots). Of the 218 lots sold, 3 artists dominated by value: 22% of the total sale was derived from works by S.H. Raza (19 lots sold totalling $3,023,146), 12% from Tyeb Mehta (2 lots sold totalling $1,624,667), and 11% from M.F. Husain (17 lots sold totalling $1,509,923). Modern works continued to comprise the majority, as they have historically, with 98% of the lots by Modern artists, and the remaining 2% by Contemporary artists. Christie’s achieved the lowest market share of the season at 16%, however based on total sales so far in 2014, Christie’s has a 32.6% market share, against Sotheby’s 31.8% and Saffronart’s 35.6%.